THANK YOU! A Big Idea…A Big Jewelry Sale! Your generosity of donations of beautiful jewelry raised $2079.50 for Reyna’s Toy Drive. We are so blessed & grateful! Thank you. We will keep you posted on the Christmas toy giveaway as it happens! …and we need your help! This summer I taught Adele Kimpell’s Lentille Bracelet class…it’s one of my favorites, but a little tricky to teach, so the other Funky gals left the task to me. Only one student signed up. In this case we normally postpone the class, but something told me to teach it anyway. So I did. The student comes to Racine a few times a year to visit family, and while here she has taken classes at Funky’s during her visits. I personally had never met her, but buzz was that she was a great beader even though she was new to it. The class would be easy to teach. So not long after the bracelet’s ‘tricky start’ we started to talk. That’s what we do at Funky’s…bead and chit chat. During our conversation I soon discovered that I was sitting with a woman who has been on an incredible journey, a story she has written about in a memoir called The Distance Between Us. A quiet and humble woman, it wasn’t until I Googled her later that I discovered what an impact her work is having within communities across the country. Reyna Grande is a literary rock star, but would never say so herself. Curious to learn more, I picked up her book from the library and could not put it down. It’s one of those books that will stay with me. It’s real. So what is the BIG IDEA …and how can you help? COME SHOPPING! SHOW CLOSES THIS FRIDAY AT 9PM! As ‘beaders’ we all make lots of stuff, can’t possibly wear it all, usually giving our work away as gifts. So lets do just that! And raise money for Reyna’s Posada Toy Drive!! 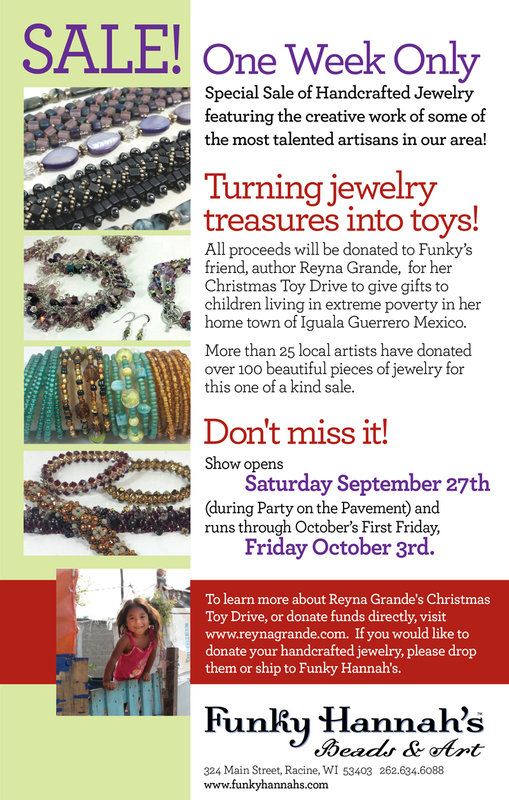 To learn more about Reyna Grande and the Posada Toy Drive click here.